At Superheroes Central we love our heroes, but sometimes there are incredibly iconic villains that deserve their time In the spotlight, and that’s just what we’ve done by bringing you some of the best realistic and authentic Joker costumes for men we could find. As you can imagine with a villain of such legendary stature there are no shortage of great costumes available, reflecting the many different incarnations he’s had over the decades, and by carefully sorting through we’ve brought you some of the best Joker costumes around. We made sure that we’ve got some great Joker costume ideas for the adults, so if you’re a fan of the immortal Caesar Romero with his iconic and original portrayal of the manic super villain in the 1960’s cult favourite television series Batman, this was similar to the incarnation that Jack Nicholson won much praise for in the movie version of Batman starring opposite Michael Keaton in the 1990’s. Both these versions were fan favourites as they mirrored the classic comic book Joker that fans loved and were familiar with. But Heath Ledger would shake Joker fans to their core and challenge what they thought they knew and loved about their favourite sociopath with his incredibly dark and gritty performance in the Christopher Nolan film The Dark Knight Rises. Truly frightening and yet compelling, his amazing performance would go on to win him a posthumous Oscar for his portrayal of the arch fiend, with many people speculating that Heath went to a dark place himself to bring that menace and loathing to the screen. And finally Jared Leto has given the Joker a makeover for the new millennium in DC’s latest attempts to bring the comic book heroes and villains to the big screen. So far Jared Leto’s version hasn’t had the same screen time as the others with only brief appearances in Suicide Squad and Justice League, but this radical and edgier version is rumoured to be appearing in own movie and we’ll see if he makes true believers out of the legion of Joker fans out there. For fans of that classic Joker look we found this great costume for adults, the style is replicated straight from the 60’s television villain played by the great Caesar Romero from the cult television series Batman. 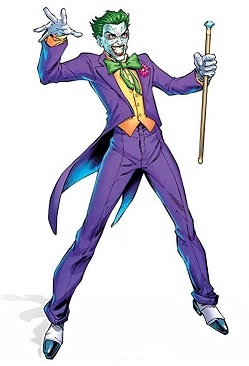 This Joker was a camp and always devious villain always plotting and capturing our dynamic duo of Batman and Robin and would later go on to give Batgirl serious problems aswell. Along with Catwoman this Joker is a much beloved version of the classic arch villain and a reflection of simpler and more innocent times. 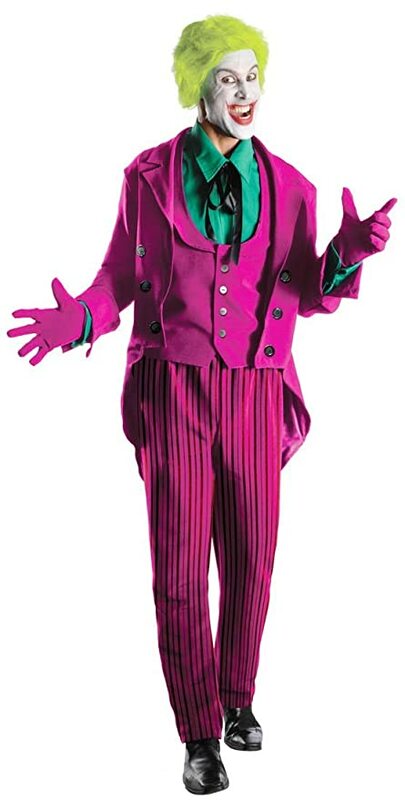 Bright purple in colour and made from polyester this awesome costume includes a jacket with shirt cuffs, vest, dickie with tie, pants and gloves. A very popular costume with men(some of who are old enough to have grown up with this version, or at least old enough to remember the reruns) it has been reviewed by lots of satisfied customers and has received much praise with people being happy with both quality and size. The only downside to this awesome outfit is that it doesn’t include a wig or make-up, so just remember to order them separately, or maybe even go with a fun Joker mask. So if you are looking for a great Joker costume that will really turn heads and get you plenty of attention, than this Classic Joker costume might be your best option. With so many Joker incarnations to choose from, another great option is this authentic Dark Knight Joker costume. It is based on the version of the Joker from Christopher Nolan’s Dark Knight trilogy and brought to life by the late Heath Ledger, with a performance that was absolutely unnerving and forever cemented his place in the pantheon of legendary actors and won him a posthumous Academy Award for best supporting actor. This was a Joker played not for laughs(although he thought everything was hilarious) but instead played for chills. Gone was the cheery yet worrisome smile of previous jokers, instead we were presented with a scarred and mutilated Joker with a point to prove, that life’s just one big Joke. So for fans of that Joker, this realistic costume made from polyester has it all and the package includes jacket, shirt, pants, vest, tie, gloves, wig and makeup kit. It has received loads of positive reviews with the majority very pleased with their purchase. So for those adults looking to portray a darker, grittier more authentic Joker then maybe this is the costume for you. The times change and sometimes we must change with them or be left behind, nowhere is that more evident than with this Suicide Squad Joker Costume. This costume based on the outfit worn by Jared Leto in DC’s Suicide Squad. It represents a radical departure of all the Jokers brought to life on the screen both big and small. A bold attempt to remake something old into something new. This Joker is somewhat of dystopian punk, and radiates menace and fear and is not at all jovial. This is a Joker for the dark new world that DC is building on the big screen and time will tell how he will rate against his other incarnations. This slick Joker costume includes a trench coat and pants, but please note wig is not included but we have included a link for green Joker wig here. So if you are looking for to be a new edgier and realistic Joker than this could be the look for you. 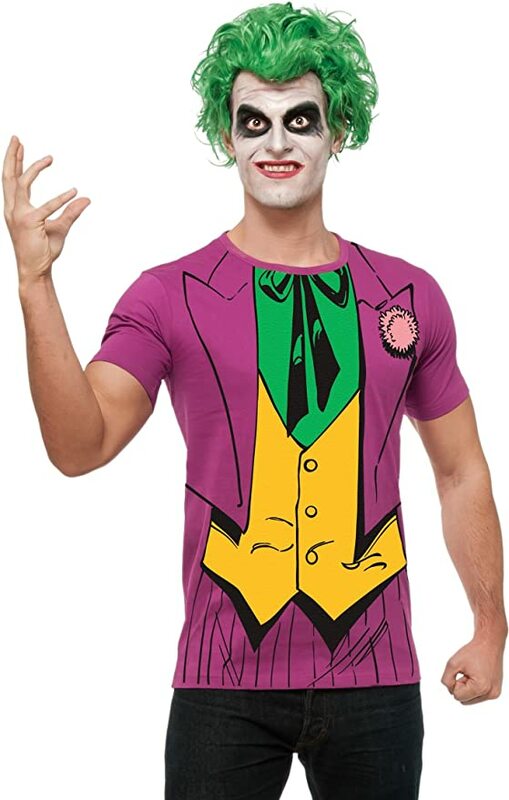 And finally if you love the Joker(and let’s face it most people do) and just want to be a part of the fun without all the hassle than this simple Joker T-shirt costume idea could be just for you. This easy costume is just a T-shirt print(classic 60’s Joker) and green wig. Super popular and people are pretty pleased with their outfit. After all have some fun, why so serious. So we’ve really enjoyed bringing you lots of realistic and authentic Joker costumes, and finally we found a great clip with a commentary on all the different Jokers from the big screen. It has all the most famous portrayals including Caesar Romero, Jack Nicholson, Heath Ledger, Jared Leto and even a surprise honourable mention of Mak Hamil’s Joker(we know right, we had no idea either, although it isn’t what you think). No doubt you’ll recognise the outfits. But what found really interesting is the referencing to the popularity of the various personas. We hope you find it as interesting as we did. The Joker is a fictitious character created way back in April 1940 for DC’s Batman comic by Bill Finger, Bob Kane and Jerry Robinson and was Batman’s arch nemesis and although he was supposed to killed off he was spared that fate due to editorial intervention. The Joker is a criminal genius and mastermind, a warped and sadistic psychopath with a sense of humour(although it’s doubtful most people would find his jokes very funny at all). Like his main protagonist Batman the Joker possesses no superhuman abilities but instead uses his high functioning intellect combined with superior chemical and engineering abilities to construct various potions, items and weapons with which he commits absolute mayhem. Although his original motives remain unclear, there is no doubt that the Joker harbours a strong malevolent antipathy toward the caped crusader Batman. A dangerous and sadistic madmen(literally as the Joker is clinically insane) his main goal in life seems to be destroying Batman’s life and is responsible for many atrocities over the decades including the murder of one of Batman’s wards, Jason Todd who was the second Robin(although in classic comic book style he returned a decade or so later). the Joker was also responsible for the brutal assault on Barbara Gordon AKA Batgirl which left her paralysed from the waist down. Despite all of his horrendous deeds, the Joker has endured with incredible popularity among fans throughout the decades thanks in no small part to the charismatic performances brought to the screens both big and small. He is the perfect foil for DC’s Batman.